Little Lava Lake is often called Deschutes Pond because it is the source of the Deschutes River. Little Lava Lake and Lava lake are naturally divided by a flow of lava, but in years of high snow melt the level rises above the lava flow, creating one lake. 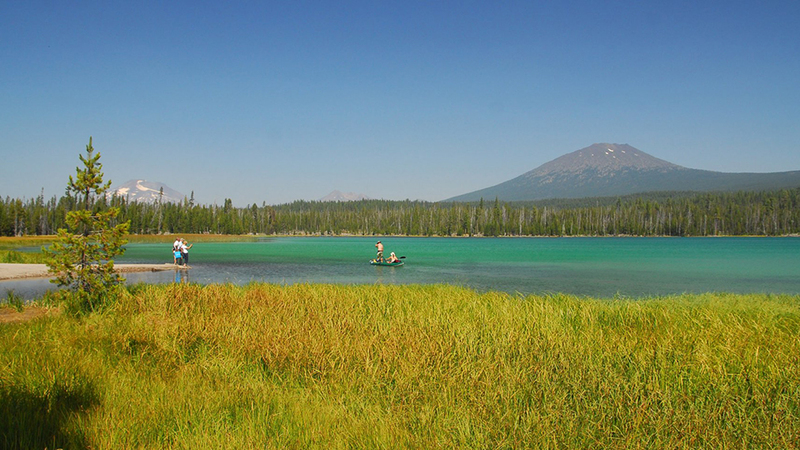 Little Lava Lake Campground is popular with fisherman in pursuit of rainbow and brook trout, whitefish, and chub. The lake allows non-motorized boats only, so it is a serene setting for swimmers and paddlers as well. There is also nearby access to several trails for easy, scenic day hikes. Little Lava Lake Campground consists of 13 single sites and two tent-only group sites, and many campers come back year after year as several sites are located right on the waterfront. Amenities at the site include a boat launch, vault toilets, and potable water. Lava Lake Resort is right next door and offers a full range of services, including a store, showers, laundry, and more. The per night, per site fee is $14 for the first vehicle and $7 for each additional vehicle. The group site fee is $50 and holders of a Golden Age and Golden Access Passports and Senior and Access Passes are entitled to a 50% discount on the fee for a single camping unit. Little Lava Lake Campground is typically open from early June through early October, but please check the web site for current season dates.